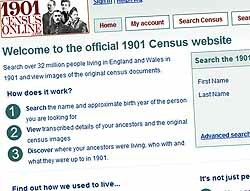 Family History UK - Free UK Genealogy - 1911 Census - Online Now! Home Home Website News FH News 1911 Census - Online Now! The remaining 9 million entries for England, Wales, Isle of Man and the Channel Islands will be added to the site over the next few months. We are Sorry to find out that Scotland's returns will not be published as yet. Brightsolid ltd, Powering the findmypast.com 1911 website are expecting peak demand to be triple that for the 1901 records (which was back in January 2002), and have made ready 26 servers – five times the previous total – to cope with demanding public appetite for researching their family history and genealogy. The overwhelming demand resulted in the earlier-than-scheduled date, with teams working flat out for two years to get records digitalised. Some sensitive information such as details of infirmity and the children of women prisoners will be held back to 2012 in line with more traditional 100-year rules about releasing census details. The 1921 census results will be the last to go online for a generation, and they will not be opened early – the 1911 ones somehow slipped through legislation that allowed no breaching of the 100-year embargo. The 1931 records were destroyed in a fire at Hayes, west London, in 1942, though not caused by enemy action, while there was no census in 1941 because of the second world war. The project is being run jointly with findmypast.com, and while registration and searching the archive will be free, viewers will have to "pay as you view" for each record. They will be charged 10 credits for each transcript and 30 for each original household page. Visitors to the website can buy 60 credits for £6.95.